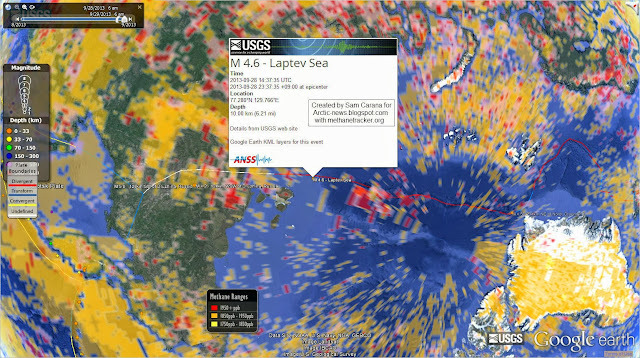 An earthquake with a magnitude of 4.6 on the Richter scale hit the Laptev Sea on September 28, 2013. This follows a number of earthquakes on or close to the fault line that crosses the Arctic Ocean and extends into Siberia, as shown on above map and on the map below. Furthermore, as earlier discussed in the post Methane release caused by earthquakes, there has been a lot of seismic activity in the Aleutian Islands region all the way up into Alaska, including an earthquake with a magnitude of 7 on the Richter scale on August 30, 2013, and several more recent earthquakes with a higher magnitude than 6 on the Richter scale. This is a lot of seismic activity for the Arctic, given that this is a relatively quiet part of the globe in terms of earthquakes. As above map shows, there were 1250 earthquakes with a magnitude of 2.5 or higher over the past 30 days globally. About 90% of the world's earthquakes occur along the Ring of Fire, on the edges of the Pacific Ocean. The fault line that crosses the Arctic Ocean marks the boundery between the North American Plate and the Eurasian Plate. Along this fault, huge amounts of methane are held in sediments, in the form of free gas and hydrates. The danger is that earthquakes along this fault will destabilize methane, causing it to rise abruptly in large amounts and enter the atmosphere. As the top image shows, a lot of methane is currently present in the atmosphere along this fault line. Methane has shown up there repeatedly, indicating that methane there has been prone to release for some time and warning that even larger releases could occur soon. Please, can you layer tectonic lines on the Grace maps? Good suggestion! I'll pass it on. Thanks. 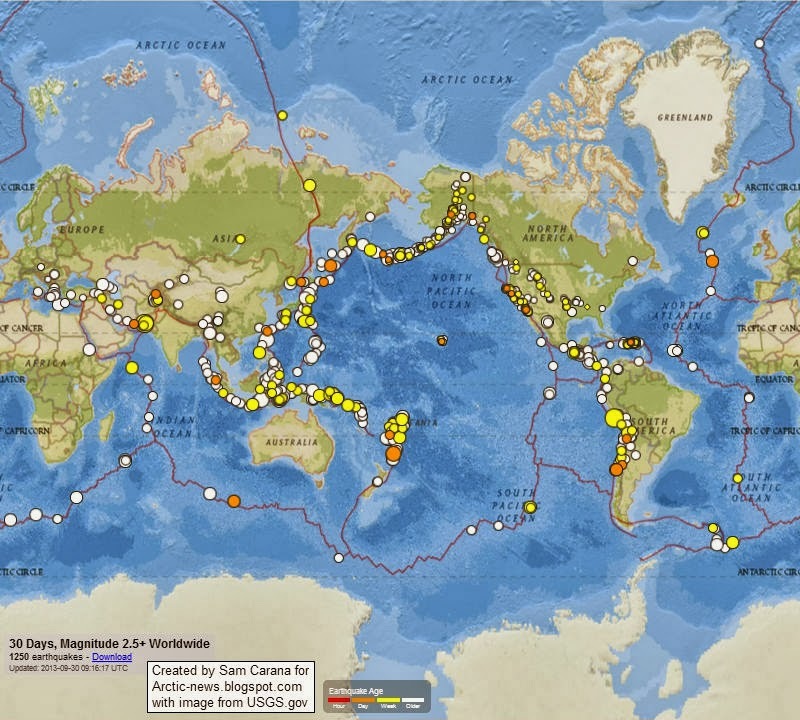 There are actually about 1600 earthquakes every month, so 1250 is rather below the average. Thanks for commenting, Shelly, the text in the post has meanwhile changed. IS THIS THE END OF THE WORLD???? The rate methane anomaly is rising in sky, perhaps billion plus tonne sudden rush of methane into sky is the only thing that can get action going for of an otherwise completely reckless specie from slumber. Certainly the fixation on crashing gov in the US is a symptom of Entropy or inability to assemble work.. Seems like the same thing that happens when I shake my Champagne only in the Champagne the gas is CO 2. 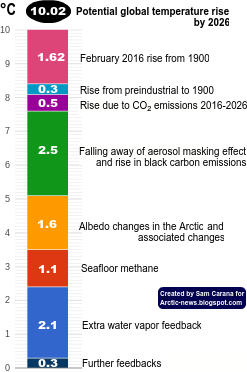 I do want to know how much methane is released when the Arctic Permafrost thaws. I have read that warming in the Arctic is causing an increase in methane releases throughout the tundra. 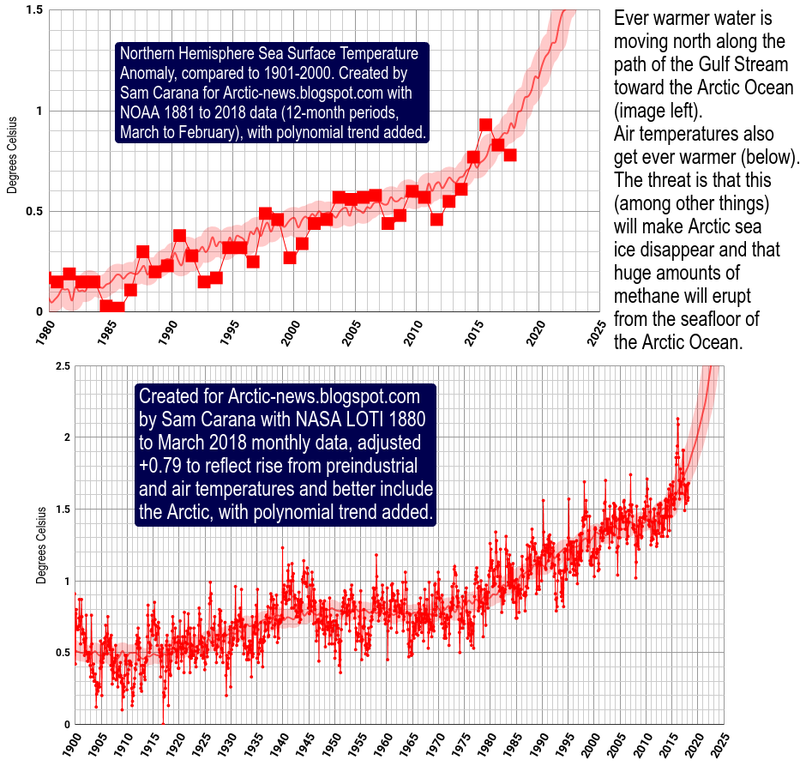 Methane release from Arctic isn't like soda pop or fizzy wine getting dropped. The release mechanism is complex and involves essentially the bugs that make the bubbles if you want to use the champagne analogy. It involves a very dynamic cork and multiple escape mechanisms. But time will tell if a monster eruption of methane happens in short order of relevance. Information is held close to the chest by the oil companies and gov that wanted to make an example of Greenpeace. I think the Powers-that-be are very concerned they can't control the fact that rate of increase of methane anomalies took off in 2007 and hit 2571 ppb in sky on approx Sept 16th. The stuff is rising into inversion layer under hydrogen at top of the Stratosphere where it accumulates and there aren't any bugs to eat methane up there. That junk is going to be the flat end of us all. Is the North Pole now ice-free? Is climate change already dangerous? Colorado flooding, what does the IPCC say?